Land at 7am local time. Thomas meets us at the airport, he has only had 2 hours sleep at a friend’s house. Drop the stuff at his house. He strolls across the road to get a taxi and we just stand there waiting for a gap, he has to guide us across. Go to Angel Garden for ribs and rice, also my first Café Suda. Walk along to the War museum, they close for lunch, we move on to Yoghurt Space. Have a bit of a wander round District 1, Thomas shows us the main Post Office, which he says reminds him of Gringotts bank. Check into the Windsor Plaza hotel. Have about an hours sleep and then go for a drink in the Top of the Town bar, fantastic views of the city. At 8pm, Thomas and Alex come round to get us and we go for a meal on Pasteur Street. Joined by Callum and his girlfriend, and also Shane. Good conversation, lots of different dishes. Move onto Pacharan for drinks on the roof. Go down for breakfast at 9am, great selection of foods. We walk down to 87 Tran Phu, have a little difficultly navigating the last 50 yards. We get a taxi over to the university. Paul Penfold is just coming back from lunch, we have a bit of a chat with him. He is very complementary about Thomas. We move on to District 7, a different world. Go to the Boomerang Bar for lunch, next to a nice lake. Walk over the bridge and into a nice air conditioned shopping mall. Taxi into town, wander round looking for the Reunification Palace, closed when we arrive. Get motorbike taxi back to 87 Tran Phu. Back to the hotel for drinks on the roof and make plans. Move on to a Vietnamese BBQ place, have loads of Beef and Ostrich. Taxi to Bui Vien, drinks in the Go bar and then sit outside number 71, only 10,000 (30p) for a bottle of Saigon beer. Get moved off the street by the police. Taxi on the way home tries to charge us ten times too much. I wake a 3am, watch the traffic for a while. Breakfast from 9 till 10, due to meet Thomas and Alex at 10:30, they turn up at 11:15. The three of us head to the pool, Thomas has lectures. Annette and Alex go in the stream room for a while. Check out at 12:30pm and leave the luggage. Get a taxi to the Reunification Palace, do the tour, very good. Also have the electric car round the gardens, very hot. We are helped across the road and go for ice cream. Back to the Windsor and transfer the luggage to the Equatorial hotel, unfortunately the pool is being repaired. We walk over to Thomas's house. Go over to Bui Vien, meet up with Thomas and have a fantastic Lemon Juice at the Spotted cow. Book day trips to the Mekong Delta, Cu Chi tunnels, and Hanoi. Get a taxi over to Braceria for a fantastic Italian meal. Alarm at 6:45, walk over to Thomas's for 7:20, taxi to Bui Vien. Go on a day trip to the Mekong Delta, about 2 hour bus ride to get to the port at My Tho. Stop at an Agent Orange outlet on the way. Get a boat over to Unicorn Island, buy some coconut kitchen utensils. Try a selection of fruits, Jack fruit, try Grapefruit with chilli salt. We are then paddled down a small river. Back on the boat and over to Phoenix island for dinner, rice and pork. Have a look a the crocodile farm. Find a very cheap shop selling loads of coconut based products. Two hours back on the bus, back to the hotel for a nice cold shower and a rest. Thomas, Alex and Callum picks us up in a taxi and we go to the BBQ Garden. Shane joins us. The meat is really not as good as the other day, but the Beer tower is great. Thomas leds us in a drinking game involving famous peoples names. Drive around in a taxi whilst Callum tries to remember where Velvet night club is. We go in, wander round, no beer, very expensive. Taxi to “Apocalypse Now”, good club, stay for one. Tired in the morning, taxi over to Bui Vien for 7:45, Alex opts for a lie in. Small minibus with ten people. Tour guide tells us that she believes that the Dead can be contacted. Very long trip to the temple, arrive at about 11:45, we have talked to a lad from Manchester called Mark. The Temple is very interesting, it is a mixture of the three main faiths. We have a meal of rice and chicken. One and a hours hours back to the Cu Chi tunnels, past a number of rubber plantations. 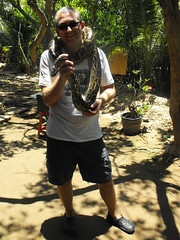 I get bitten as soon as we go onto the jungle. See the man traps and hiding holes. I fire ten rounds from an AK47. I follow the tunnel for 100 yards underground, sweating like a pig when I get one. Drinks lots of green tea. One and a half hours back to Saigon. Have a beer with Mark, Thomas and Alex come to find us. Thomas goes off to Hockey, we go for a meal at the Mumtaz, rather average. Back to have a drink outside number 71 Bui Vien, meet Thomas's friend James. Back to the hotel for 10:30, cold shower. Nice lie in, Annette packs the stuff. Taxi over to Thomas's house for 11am, Thomas goes off to school at noon. 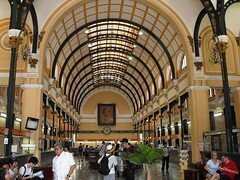 We go to Saigon Square, rather unimpressed by the shopping center. Walk along to the Bootleg bar but it is shut. Head to the river and walk along, it starts to rain so we head into a bar, I have green tea and we watch the boats. Walk around District 1, stop for lunch at Highland Coffee, I have Nasi Goreng. 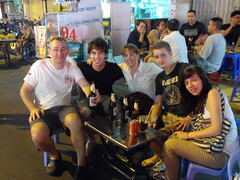 We get a taxi over to Bui Vien, and have a drink upstairs in the Stella bar, Thomas comes over to meet us. Back to his house and leave at 5:30 for the airport. Very heavy traffic, a bit late arriving. After we have checked in we look for our flight on the board. After a while we notice that the electronic board is not updating and that our flight is boarding. 1¾ hour flight to Hanoi with JetStar, I read about the various hotel scams that operate there. Arrive at 9pm, there is a scrum of taxi drivers who all want our money, we choose the one that is not shouting at us. Check into the Hotel Boutique 2, mini suite. Walk down the street for some food, I have Beef Pho, very good. Thomas and Alex beat us down for breakfast at 8:30am. Have a good wander round the Old Quarter. Get as far North as the Long Bien bridge. Walk back to Turtle lake and go to the City View Cafe for drinks. Get a cyclo to Ho Chi Minh park. We agree at 150,000 for two people, but they seem to forget this when we arrive and try to charge us 150,000 each. 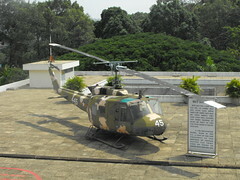 Have a look round Ho Chi Minh's house and at his cars. Get a taxi to Quan An Ngon, this one seems to have a broken meter which counts up far too quickly. Thomas points this out to the driver and they decide on a flat rate. Loads of good food, noodle, pancakes, minty spring rolls. This is the same place that Top Gear ate in, they had sparrows here. Walk back over to Turtle Lake, have a walk around it. Have a nice drink by the side of the lake. Walk back through the Old Quarter, stop for Beer Hoi at a small place, 15p per glass. Decide to try somewhere else, wander round for a bit and then end up in the same place. We get talking to a couple who have lived in Hanoi for three years. Thomas and Alex go off for a drink with them, up by the Long Bien bridge. A rather quick breakfast, pick-up arrives at 7:45 prompt for our trip to Halong Bay. Pick up 13 people in total, 4 from Argentina, 2 from Finland, 2 from Australia and one from Texas, Tony is our guide. Very rough roads on the way to Halong Bay, stop at a Pearl necklace shop on the way. They carefully tells us now to spot a fake pearl necklace, I notice that on the walls there are fake pictures of celebrities with pearl necklaces superimposed. Get loaded onto our boat and under-way for 12:30, fantastic cabins. We have lunch off prawns, mussels, crabs and rice. We have cocktails to go with it. Stop and go into the largest cave in the area, very impressive. Follow Tony and do some canoeing for about an hour. When we get back three of us have a go at jumping and diving off the top of the boat. Water is nice and warm. Shower and then tea, prawns, bay fish, bottle of wine. Nice relaxing time on the roof. We are dragged back down to do Karaoke, I do Hotel California, Daddy Cool, Hey Jude, I think that I sing really well. Annette does Manic Mondays. Back on the roof for more beer till midnight. Up for 7:30 breakfast, fried eggs, sausage, toast, jam and cheese. Annette is suffering from too much sea food yesterday. At about 10:30am we arrive at a fishing village, we are taken in bamboo boats to explore some caves and the village. See the kids at school. Buffet lunch on the boat, back to Halong city for about 11am, relax on the top of the boat. The sun comes out and I am dripping with sweat. Watch the boat being refilled with water. Coach back to Hanoi for 5pm. Arrange travel for the next couple of days. Taxi to Turtle lake, eat at Highlands Coffee, I have Caesar salad. Walk back to the hotel. There are a few last minute problems with the travel. Taxi to the train station for 10:30pm, the train is waiting. We board the train, we are sharing a cabin with two women. We buy some cans of 333 from the station and then more from the beer woman. Lights out at 1am. Annette wakes me before 6am and we watch the view, loads of rice fields, straw hats, etc. The coffee woman comes round at 7am, café suda. Thomas and Alex stay in bed till 10:30am. Go through the DMZ. Arrive in Hue at 11:50, Annette leaves her Iphone on the train, we have to rush back get get it. Taxi to the Queens Hotel 1, very nice. We book a private hire boat trip on the Perfume river. A couple and their small baby live on the boat. The woman goes off to buy us some spring rolls from the market. Go to the tomb of Minh Mang, takes a long time, but worth it. See some people taking part in the local version of the Amazing Race. Have a quick look at the Thien Mu Pagoda on the way back. They drop us by the Citadel, but unfortunately it is shut. Head over to Little Italy for tea. Buy some rather good paintings on silk. Bed for 10:30pm. Up for breakfast at 7am, taxi to the railway station, train is a little delayed, due at 8:02. Enjoy the views, the tracks go right by the coast for the last couple of hours. Arrive in Da Hang for 11am, taxi to the Pearl Sea hotel, I have been reading the guide book and it is less than 30km to Hoi An, so we have a quick cold shower and jump in a taxi, about £12. When we arrive go for a bite to eat, have some very nice Beer Hoi for only 4000 dong, 12p a glass. I have beef with fried noodles. Walk round the Old Town, and over the Old Japanese covered bridge. Walk through a proper local market, live chickens running around, some very strange smells. By 4pm, we are all a bit tired so head back to Da Nang, hoping for a swim on China Beach. During the taxi ride back and sky turns very black. We are watching from our hotel room on the top floor when the wind gets up and nearly blows the window out. Cold shower and then put my jeans and shoes on, ready to go out at 7pm. I feel a strange need to put a jacket on, but soon come to my senses. Taxi to the Waterfront restaurant, sit upstairs overlooking the port. We have English and Vietnamese platters to start, I have a Beef Tenderloin, with two bottles of very nice red wine. Thomas is very impressed by the service, he has belly pork. Home for 11pm. Get up at 5:50am, loads of people are already up, taxi to the airport. It is very new and smart. Fly at 7:50 to Saigon on a JetStar 737, land at HCMC domestic terminal. We get a taxi to Thien An hotel in District 1. Thomas comes round on his bike and I go with him to look for a new mobile phone. Have a very nice Cafe Suda on the way. The four of us go swimming in District 10, near to where he plays hockey. The sky is blue and the water is as hot as a warm bath. Get a taxi over to the 4 P's restaurant, we are a little delayed, Shane joins us. There is a sign on the table saying welcome Mr Tom. Very good pizza and wine. Move on to the bar just to the right of the Crazy Buffalo for a couple of Saigon Greens. Lounge in bed till 11am. Thomas and Alex come round and we follow the recommended walking tour of District 1. At about 3pm we nip into Alibi for a drink and to cool off. Whilst we are there Annette sees a sign for a kebab and mentions that she would like one on Saturday evening. Previously she had told us that we fly late on Saturday so I quiz her about how we can also be at home on Saturday evening. After a little debate it transpires that we fly at 12:30am on Saturday, i.e. this evening. Annette and I go back to our hotel and quickly pack. We leave our cases at the hotel and taxi over to the Chill bar. Arrive just before dusk, fantastic views over the city, spend about an hour there. Thomas and Alex come and pick us up and we go to The Refinery for our last meal of the holiday, Shane comes along. Very good food. Taxi to the airport and fly home.